I’m not someone who eats Italian style food very often, but when I do I almost always make my sauce from scratch. There’s just something extra delicious about a sauce that you’ve put together yourself and let simmer for hours. Nothing beats it. However, sometimes it’s just not feasible… Sometimes it’s too hot to be standing over your stove for hours, and sometimes you only have a few hours in the evening between getting home from work and going to bed. This is typically my story-and after an entire day home alone, poor dog Bub hates it when I can’t sit down and love him because I’m standing over the stove. He hates it even more when I wont share my food with him though… Ha! A few weeks back a good friend brought over a nice big zucchini from his garden and I’ve been wanting to eat it with a nice meal for a while, and last night I was craving marinara sauce. For someone who doesn’t eat much Italian food, I do often get a good craving for a nice Marinara. Trick is, I knew there was no way I was going to make it from scratch-so I was pretty happy to find Mezzetta Napa Valley Homemade Pasta Sauce at my local grocer, and there are SO many flavors. It actually took me a good 10 minutes of going back and forth before I finally decided to try the Parmesan, Asiago, and Romano style sauce. I was really debating trying the Sweet Basil or the Spicy one-but the Wild Mushroom and the Roasted Garlic and Caramelized Onion ones also looked delicious. They all looked good… I’m definitely going to have to try the other flavors soon. I was also extra happy to turn over the bottle and read the ingredients. It’s kind of rare when you can actually pronounce all of the ingredients, and not only that-but you know full well what they are and you use them on a regular basis. I’m always wary of the weird gum and stuff other store-bought sauces put into their jars, but the Mezzetta Napa Valley sauces seem to be mostly whole food ingredients. For instance, the bottle I picked up lists the three cheeses plus California plum tomatoes, fresh whole cream, sweet basil, sea salt, and freshly chopped onions. There isn’t a weird preservative on the list! Love it. I’ve also been watching a lot of food network shows like Chopped! 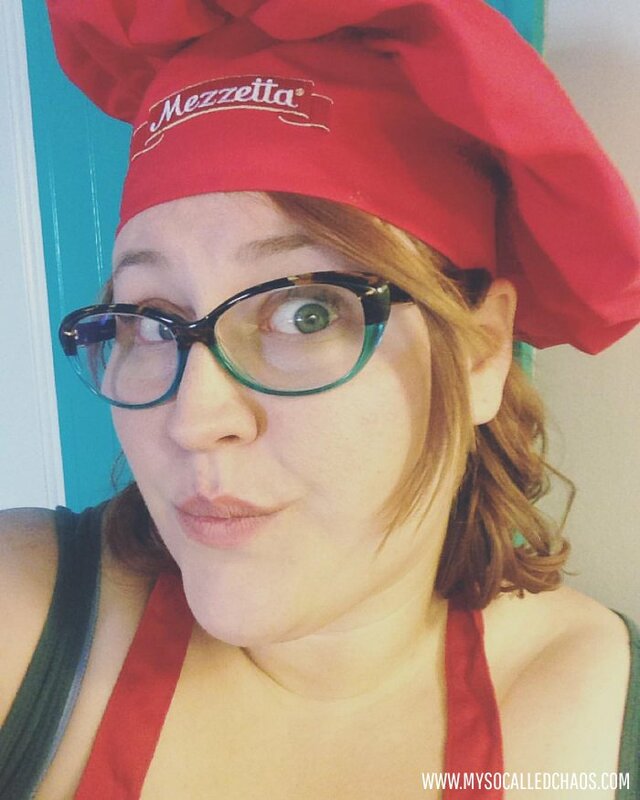 lately-so for some reason I’ve been thinking about food in layers and trying to figure out what I can do with it creatively, while also using my cooking as a way to get healthy and lose weight. 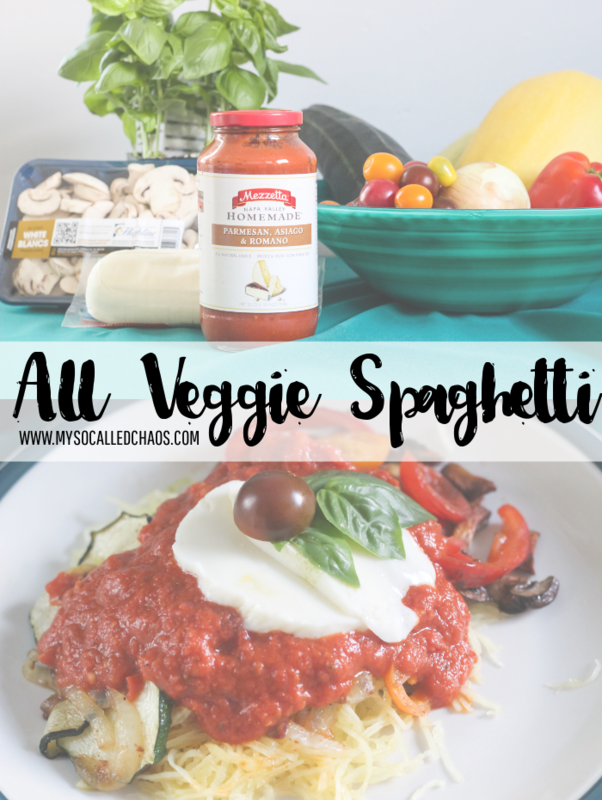 This inspired me to grab a few more veggies and make an “All Veggie Spaghetti” with Spaghetti squash instead of noodles. 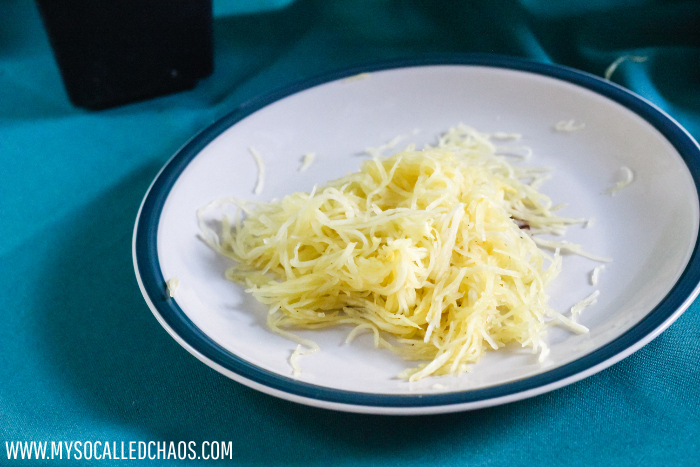 I honestly think I like Spaghetti Squash a lot more than actual noodles, and it’s infinitely better for me-so I’ll run with that! Well, my dish turned out AMAZING, and while I was still skeptical of this store-bought sauce even with it’s amazing ingredients and it’s homemade mantra, it was surprisingly good as well. A little tart straight out of the jar, but once it was heated up in a skillet and paired with all the veggies it was the perfect compliment. So I’ve decided to share my recipe with you today. The first thing you’ll want to do is get your Spaghetti Squash cooking. Preheat the oven to 375°. Start by slicing off the ends of the squash on each side, and then cut it down the middle. Then using a large spoon (or ice cream scoop) scoop out the seeds and pulp in the middle of the squash. It’s a bit like cleaning out a pumpkin when carving for Halloween. Put both halves on a baking sheet, give them a thin coating of butter or Olive Oil (Olive Oil is healthier, but sometimes that butter taste is what you need. I actually used a butter substitute for mine-so I’m getting the best of both worlds haha!) and sprinkle them with salt and pepper. Stick it in the oven for 40 minutes. 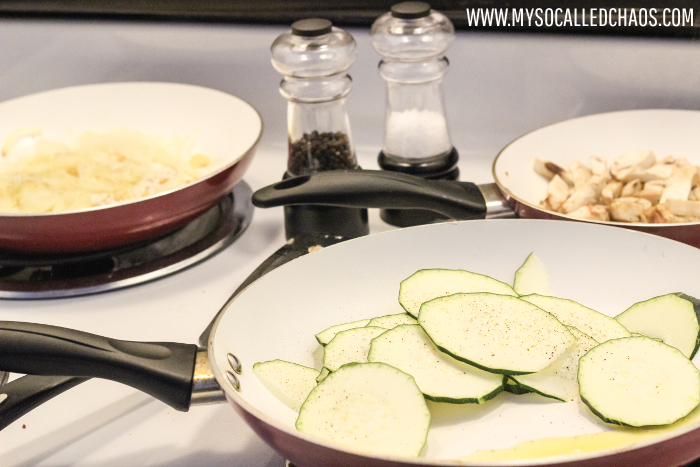 While your Spaghetti Squash is cooking, start sautéeing your veggies in your choice of fat-butter or olive oil, etc. You have 40 minutes so this gives you time to cook them slower and get them just the right consistency for you. I used three different pans for the different temperatures and cook times, but you could just throw them all in together if you’d like. I wanted my garlic, onions, mushrooms, and zuchhini nice and sautéed but I wanted to leave my red peppers a little crispy for a good texture. So after the zucchini finished I tossed it in with the garlic and onions while I threw the red peppers and about half of my baby heirloom tomatoes in for a quick fry-without letting them get too soft. Add salt and pepper to each of the pans as you cook to taste. 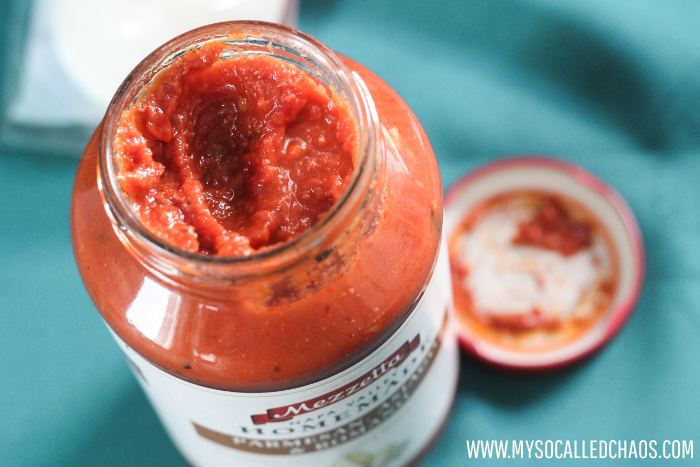 If you’re working with homemade sauce, it’ll probably already be warm, but since I was using this tasty Mezzetta sauce I moved the tomatoes and peppers out of the pan and then poured about half of the bottle into the big pan I’d been using to sautée in. This helps bring the flavors together since the pan will have remnants of the different flavors I’d been cooking in it, and it was a quick way to heat up the sauce. 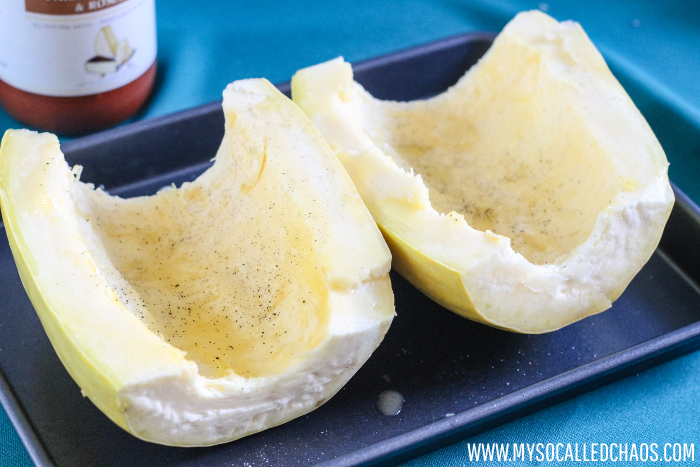 By now your Spaghetti Squash should be about done. Take it out of the oven, and then using fork, the insides out of the squash and onto your plate, it will naturally come apart into a shape similar to that of spaghetti. It may seem like it’s still kind of hard, but that’s okay because you want your “noodles” to retain some of their delicious fresh squash crunch. You should be able to eat everything up to the skin, it’s all the tasty “meat” of the squash. If there’s one thing I’ve learned from the Food Network, it’s that presentation is everything. I’m not sure it’s everything, because taste is important, but a well plated dish definitely seems to increase the flavor of the food. For this All-Veggie Spaghetti I topped the Spaghetti Squash with a heaping pile of my sautéed zucchini, mushrooms, onions, garlic, red pepper, and baby heirlooms; and then I took the rest of the baby heirlooms and threw them in as well to add another level of fresh flavor. This ended up being one of my favorite parts of the dish even. 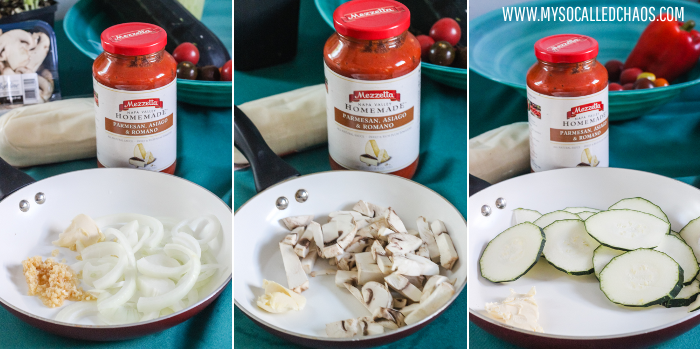 After piling on the veggies I went ahead and topped it with a nice heaping spoonful (okay, maybe I did two spoonfuls) of my delicious marinara sauce. Then I garnished it with a couple slices of mozzarella cheese, a few sprigs of fresh basil, and a cute little baby heirloom on top. I was very pleased with both how it looked, and how all the flavors melded together to make a very delicious dinner with so many levels of flavor and texture. 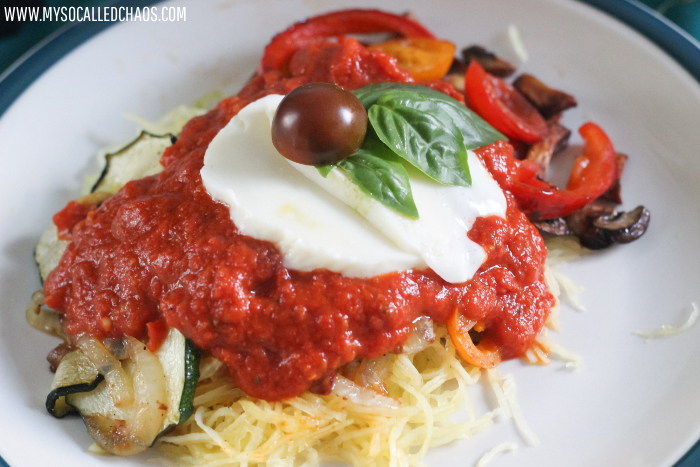 The crunch from the Spaghetti Squash beats soggy noodles for me any day, and the extra shot of flavor from the fresh tomatoes and basil just make it seem so fresh! This was the perfect dish for a “goodbye Summer-hello Fall!” harvest feast. I ate every last bite and made some for the next day too! Also, in spite of the lack of meat, my crazy canine sat and licked his lips and stared desperately at me while I ate. He must have picked up on all the good smells. I could tell he was super glad it only took me an hour to put this together so I could spend the rest of the evening snuggling with him on the floor-time saved is a great thing when you have bonding to do. 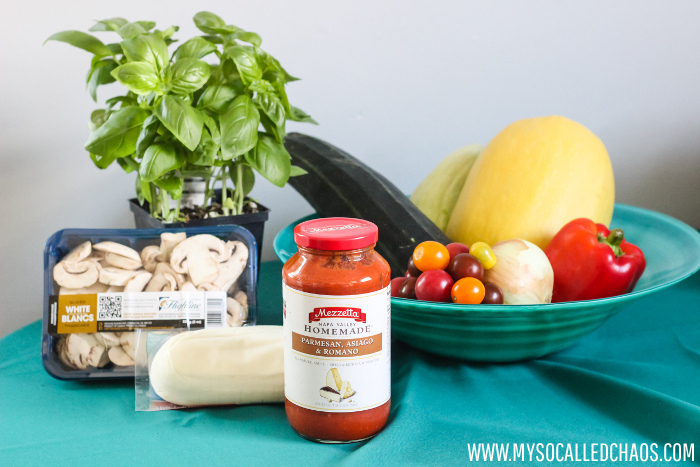 Want to win the Perfect Pasta Night? 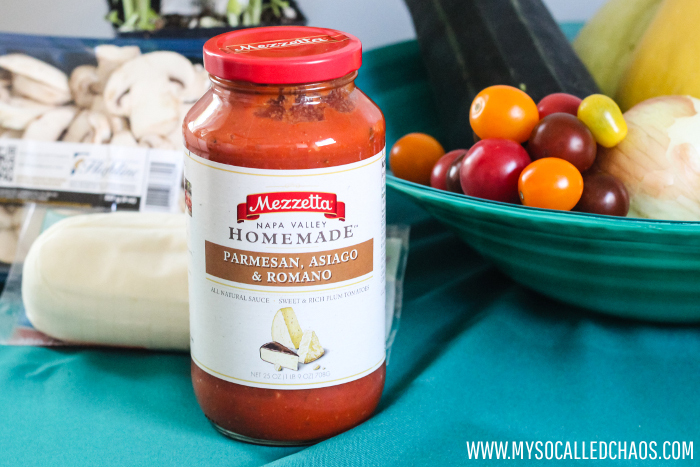 Mezzetta is giving away one grand prize and a few runner up prizes!